I have this thing with organising. I could spend hours upon hours just organising everything from my clothes, to my uni papers to my makeup. I don't know why but I just love it. 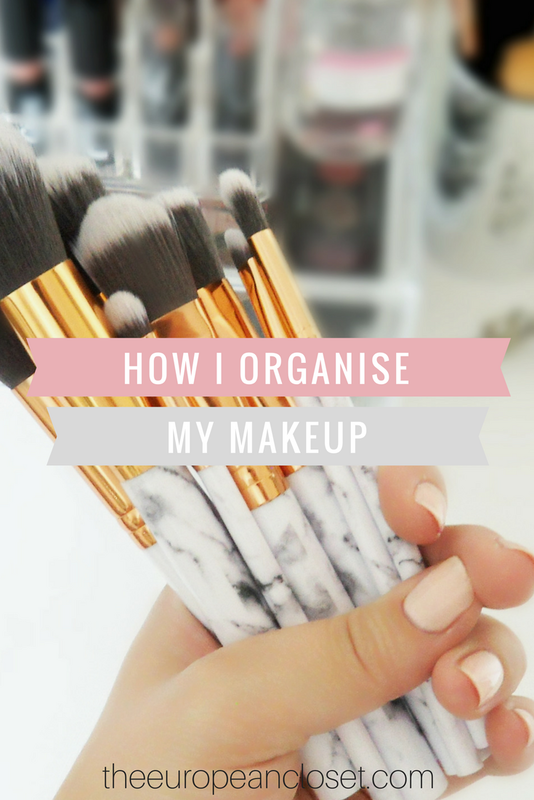 Today, I decided to show you how I storage my ever-growing makeup collection. I bought these acrylic drawers from Primark a few weeks ago and I'm in love with them. They cost 10€ and actually storage loads of things. I didn't have a place to place my makeup palettes before I bought this unit but now I just place them all (it's not like I have a lot of eyeshadow palettes anyway) inside the first drawer alongside a few face powders I reach for everyday. On top of the drawers I have a foundation/lipstick holder I got from a local homewear store for about 6€. I've had this holder for about two years now, I think and it's very handy. Here I storage my go-to lipsticks (liquid and regular ones) as well as my go-to foundations, primer and setting spray. Also, on the back, I have two eyeliners, my go-to mascara and some lip and eye pencils. When it comes to my brushes, I store them in two different containers. The silver cup is supposedly a 'toothbrush holder' but when I saw it I knew I hat to get it so I could use it as a brush holder. And the best part: it cost only 2€! Mind= blown. I also use a mug I got at Flying Tiger two years ago. I don't really drink tea or coffee so the mug was just sitting in the cabinet until I decided to actually give it some use. Now it sits there looking all pretty with these amazing marble brushes inside. Got a Gift for Me?